What can I recycle at the Consumer Drop-off Stations? Each of the 9 consumer sort stations have commingled bins for collecting your recyclable materials. No sorting required! Recycling aluminum cans saves 95% of the energy required to make a new can. It is not necessary to remove the paper labels from your cans. But do rinse out any remaining food. Empty aerosol cans may be recycled. We recycle plastics #1 - #7. Caps and lids may be left on. Polystyrene (styrofoam) products are NOT recyclable. 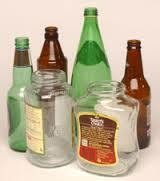 Glass bottles and jars can be rinsed and recycled. It is not necessary to remove labels. Newspaper, junk mail, office paper, magazines and cardboard and boxboard are accepted. Prohibited plastics - Plastic bags, shrink wraps, Styrofoam, buckets, toys, vinyl siding or plastic furniture. Prohibited paper - Greasy paper such as pizza boxes. Place shredded paper in clear plastic bags only. We do not have any place for trash or garbage. Do not remove anything from the bins as the materials collected are property of Borden's.